Time has seen the growth and expansion of the "marine reef" aspect of our hobby to include more and varied groups of wildlife. Amongst all the "other" stinging-celled invertebrates in particular, two non-Scleractinians (the taxonomic category that comprises the "true" or stony corals) have become stock items in dealers and hobbyists tanks; the red pipe organ (Tubipora musica) and blue (Heliopora caerulea) "corals". Except for the ever-present issues of wild-collection, natural stock depletion and reef destruction, these organisms are very appropriate in their application for captive use. They are hardy, easy to maintain, and tolerant of aquarium conditions relative to most true corals. Herein is my review of what these animals are, their placement in the scheme of other stinging-celled animal classification how to select and care for them. Phylum Cnidaria (Coelenterata): Stinging-celled animals. Class Hydrozoa: simple, tube-like stomach. Small medusa stage and a small to large Polypoid stage. 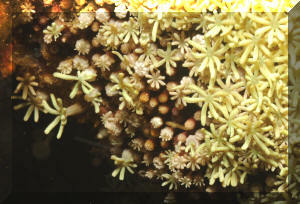 Order Stylasterina: Hydrocorals; mostly deepwater. Order Siphonophora: Typically planktonic, colonial. Physalia, the "sailor by the wind". Class Scyphozoa: Jellyfishes. Have four-chambered stomachs. Most have large medusa and small polyp stages. Order Cubomedusae: Sea wasps. Medusae with four groups of tentacles. Class Anthozoa: Polyp stage only, stomach divided into numerous compartments. Subclass Octocorallia: Octocorals. Anthozoa with eight-multiple tentacles. Almost all colonial. 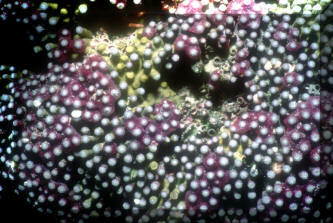 Order Stolonifera: Polyps arise from a creeping mat (stolon). Skeleton of calcareous tubes. Includes Tubipora (organ-pipe coral) T. musica shown here and below. Colonies in the Red Sea. Order Alcyonacea: Soft corals. Fleshy, rubbery. Mushroom or variously lobate growth forms. Skeleton of separate calcareous spicules. Order Coenothecalia: Comprised of only the Indo-Pacific blue coral, Heliopora. Order Gorgonacea: Sea fans, sea whips, precious red jewelry coral (Corallium). Long stiff internal skeletons. Horny, upright plantlike growth. Colonial. Subclass Zoantharia: (Hexacorallia), Solitary or colonial. Eight or more tentacles, multiples of six. Reef and non-reef building corals, anemones. Order Actinaria: Sea anemones. Solitary or clone polyps without a skeleton. Two siphonoglyphs. Order Scleractinia (Madreporaria): True or stony corals. Solitary or colonial polyps with calcareous skeletons. Order Ceriantharia: Tube anemones, elongate tapered bodies. Live in secreted mucus tubes. Order Zoanthidea: Colonial anemone-like polyps. One siphonoglyph, no skeleton. Order Corallimorpharia: False corals or coral-anemones. Solitary or colonial, flattened coral-like anemones. Tentacles radially arranged. Look like true corals, but lack skeletons. "The two species of non-Scleractinian corals of interest to us here have almost identical criteria for selection and care; what is stated, unless otherwise indicated applies to both Tubipora and Heliopora. The massive colonial Heliopora caerulea is often termed a "living fossil"; very similar skeletal material is found in sediments dating back to the Mesozoic era, more than eighty million years ago. Heliopora colonies can appear tree-like, plate-like or as columns depending on growing conditions; pieces offered in the trade have been snapped off from the growing tips of these colonies. As far as appearance, blue "coral" looks more like the stinging (non)coral, Millepora (actually a Hydrozoan), with it's fine polyps penetrating a fine crystalline matrix of Aragonitic skeleton. Yes, their skeletons are naturally blue, throughout. "The genus Tubipora has four nominal species; though, according to Veron, these all probably represent only one valid species, T. musica. Organ pipe coral is also a massive colonial animal, readily recognized by its blood-red cemented parallel tubes interconnected by horizontal platforms. As per the Subclass bearing, Tubipora polyps have eight tentacles, arrayed like feathery palms when exposed. Organ pipe "coral" is used extensively in jewelry and as ornament, and I can testify, is very often overlooked underwater for being what it is. Tubipora in the wild. Below in the Red Sea, open and closed and in N. Sulawesi, Indonesia. Both Tubipora and Heliopora are widely distributed over the west Pacific, to the south of Japan, west to Africa's east coast, and up throughout the Red Sea. 1) Purchase specimens that have been "hardened" for a week or two at your dealers. A small deposit should ensure timely holding; if not, look for another source. 2) Observe the specimen carefully at the dealers. Are polyps out and fully operational? 3) Smell the water the animal is in; live and healthy specimens smell "earthy"; bad ones' bad. 4) Check for necrotic, rotting "whitish" areas. Torn, dissolving sections are indications of almost certain doom/failure. Of the two, Heliopora is hermatypic; that is, a reef-building organism physiologically linked with endosymbiotic algae. Hence its need for sufficient full-spectrum lighting and proper placement in captive conditions. 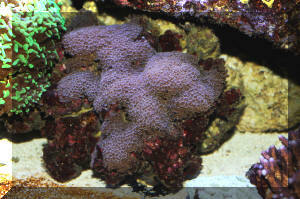 Tubipora is much more tolerant of low-light situations and is often found overshadowed on the reef. Just the same, it should be placed in a lighted condition. Per a standard tropical reef captive system; steady temperature in the 70's, low eighties; higher pH (upper sevens, low eights), elevated alkalinity (2.5-3), calcium ability (up to 400ppm) through aragonite, other substrate, feeder, Kalkwasser... to promote calcification in these reef-building species. As compared with real or stony corals, Heliopora and Tubipora are relatively innocuous, rarely stinging/digesting other contiguous stinging and non-stinging animals. Take care that those placed near them are similarly inclined." "Some folks endorse "drip" acclimating these cnidarians; in the trade they are summarily "rinsed" in prepared system water and simply dunked into their respective holding systems. Coral eating fishes generally ignore blue coral, but Tubipora can be picked apart and is a favorite of those nemesis' of reef keepers, the errantiate polychaetes called bristleworms. Heliopora is dioecious (separate sexes), and displays synchronous (at the same approximate time) release of gametes in early January. Fertilized eggs and planula larvae are dispersed by surface currents, settling on hard substrates if fortunate. Blue coral has been successfully cultured in captivity. Some organic material in the water adds to the survivability and growth of both these species. Especially, should you employ a highly effective skimming or chemical filtrant unit, frequent feeding of your other livestock (fishes, invertebrates) in their vicinity is encouraged. Additionally basting them in a dilute mash of small animal-based food supplemented with vitamins and iodine on a daily basis (using a low-tech plastic "turkey" baster) ensures their nutrition. The octocorals called blue and organ pipe are not "true" or stony corals, but have found tremendous popularity with reef aquarium keepers for their curiosity, beauty and hardiness. Paramount to successfully keeping Tubipora and Heliopora are plenty of current, sufficient alkalinity, calcium. Otherwise typical reef conditions suffice for these two non-corals, given that you pick out initially healthy specimens. Debelius, Helmut & Hans A. Baensch. 1994. Marine Atlas, v. 1.MERGUS, Germany. 1216 pp. Erhardt, Harry & Horst Moosleitner. 1995. Meerwasser Atlas, Band 2, Wirbellose Tiere. MERGUS, Germany. 736pp. Weingarten, Robert A. 1992. Notes on the reproduction and development of Heliopora caerulea. FAMA 1/92. 1-6) Heliopora in aquariums (1-3); the last a dead "curio" piece. 4-6 close up and colony shots in the wild, Cebu in the Philippines. 7-11) Tubipora: 7,8 in captivity, 9 in one foot of water in the Philippines, 10,11 in the Red Sea at about ten feet of depth.